Happy New Year! So it’s that time again and we are working hard to prepare for our 2nd stint at Colombo Fashion Week. This year promises to be bigger, badder and better with CFW tying up with Miami, Russian and Malaysian Fashion Weeks too! Once again we’re opening up the show and are super excited to be a part of what promises to be an exciting event! We’ve been working around the clock on this latest collection, so stay tuned for more info! So we’ve survived a year…despite Wall Street sending the World into chaos, Swine Flu, the passing on of a legend (Ed. – We still love you MJ) and more airline crashes than we’d care to mention, we’re still filled with optimism. Maybe it’s because we’re young, or maybe it’s because we know that there is something ever so bright on the horizon. We at L.i.C.C. want to spend our 1st Anniversary looking forward; we’ve had one heck of a year – we started in 2 stores on the 8th of December 2008 and in those 357 days til now, we’ve managed to grow that number to 12, venture overseas in 2 models, launch a collection on a ramp and even garner over 1,800 fans on Facebook! I guess what we’re trying to say is thank you – without all of you out there reading our blogs, contributing and (most importantly) buying our jeans, we wouldn’t still be around! Our team has been busting their behinds night and day to continuously develop product for you and, well, we’re glad you appreciate that! So onwards to 2010 and what it holds for us at design HQ – we have some interesting projects in the pipelines, the most interesting being L.i.C.C. Concept: we’ve decided to take our ramp shows onto a slightly different path, offering a playground for our designers where they can truly go to town! We also have our 3rd season starting to make its way to stores, with some value added product for both men and women, and I guess one of the most exciting things about 2010 is that we get to share so many more experiences like this all over again! So until then, wishing you and your loved ones a very happy run up to 2010! As Winter slowly creeps up on us, we at L.i.C.C. have started preparing for the exciting months ahead of us. December sees the launch of our 3rd season as a label, and we’re excited! Our most definitive season to date sees our team reaffirm its commitment to crafting beautiful denims. We have a lot of work going on in the pipeline. We’re now close to opening our 2nd Concession in India, with the opening of Store One in Nagpur. We’re really excited about the way the brand has evolved over the past 11 months and we’re looking forward to celebrating our first birthday in some shape or form! We’re not putting on the brakes yet though, our talented team of designers have already started conceptualizing Seasons 4 and 5 and we have just signed on to participate in Colombo Fashion Week next year! I think the most fun we’ve been having at the moment though is trying to select the ideal models for our photoshoot next month – it’s a process that ALL of our team are actively involved in and this time we promise some insight into what actually goes on backstage! ‘Til the next time, Much Love. So, a new season is almost upon us, we’re about to head into Pune and Nagpur shortly…so here is a little taste of what’s to be expected. All of us at L.i.C.C. have a dream; whether it’s our relaunched site (http://www.liccjeans.com) or our video – there’s lots more to come! All you have to do is try on a pair…and then we hope it’s not your last! Having lit up Colombo, L.i.C.C. Jeans Co. (pronounced Lick) has set its sights on a new home – India. The label has matured into a bonafide contender over the past two seasons by enticing their customers with their no nonsense take on fashion. The designer jeans-wear label made a splash at the end of 2008 and the denim line continued in similar fashion at Colombo Fashion Week 2009 with their innovative take of traditional denim and vibrant range of colored jeans. The trendy label is the first ever fashion jeans wear brand to premier in Sri Lanka, and promises ‘Luxury for Less’ offering haute couture denim at reasonable prices. The brand offers a unique proposition to this part of the world by offering trendy and superior products at reasonable price points. The brand works with the best quality fabrics, accessories and the latest techniques and is based on a philosophy of taking pride in the customer satisfaction and enjoyment of its product. Your first pair of L.i.C.C. Jeans will not be your last. 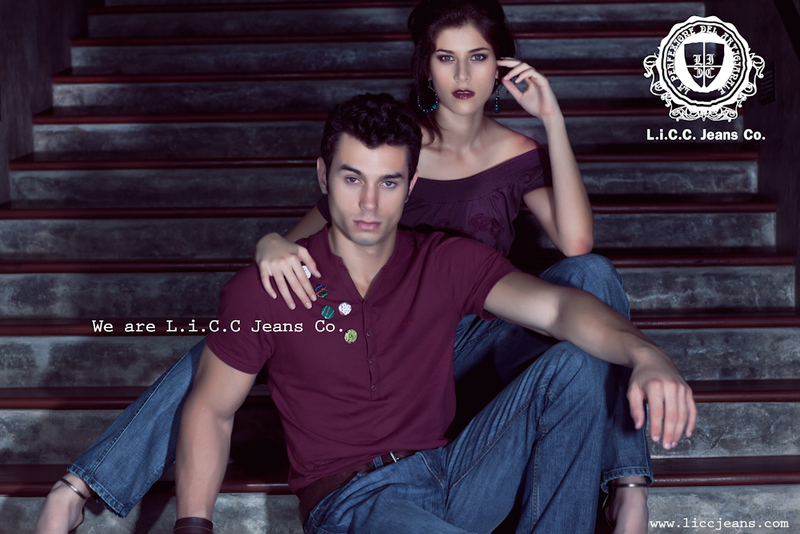 Launched by the Long Island Clothing Co., the L.i.C.C Jeans range is currently available at Besos in Mumbai (Kemps Corner and Bandra) and a flagship store in conjunction with Indiabulls’ latest venture – Store One, in both Pune and Nagpur. The latest L.i.C.C. collection promises innovation and fashionable takes on traditional denim as well as those essential ‘luxury’ basics for both Men and Women. The fashion jeans are crafted to perfection and provide the best fit for any size, with a range of cuts and styles for both sexes. The designs are varied to ensure that every need of the consumer is met, from the highly-flattering high-waist, to the hottest style on the catwalks – skinny jeans. Similarly, the washes have been replicated with age old secrets to master the ‘worn-in’, vintage look. The brand is currently available in Sri Lanka at Odel, Cotton Collection and Hameedia. We’re all unique – that’s what makes us special. Like our sense of style and taste, our bodies too are different. What suits one may not suit the other – it’s the same with jeans – you need to learn how to make the trends work for you. Jeans are a staple – while faded, distressed and ripped jeans are everywhere at the moment, these don’t work for everyone. If you have slim hips and thighs these are actually perfect for you as they will create curvature and shape, but if you’re naturally curvy, try and avoid the whiskering and look for clean washes. If you’re more of a pear shape, then a boot cut or wider leg jean is the ideal fit for you, unless of course you’re going to work it with high heels and a straight leg or skinny pair – these naturally accentuate your curves. If you want to go one step further and dress it up, go for a dark rinse wash or colored pair and really make a statement. If you personally prefer a pair that fits like a second skin, then go for a snug fit EXCEPT for on the waist. If you go up a size, the jeans are likely to stretch out during the course of the day and look unflattering. Instead sit down, stretch a bit and see how the jeans form to your figure when you try them on. Finally to look like a knock out in your jeans, please remember the importance of pocket placement. If yours lacks shape should try a flap back pocket or a detailed back pocket design for a lifting effect. A fuller behind should stick with minimal pocket design, and a moderately sized pocket for a great shaping feature. That’s all for now, Have a Great Weekend! How do I care for my jeans? While most denim brands list standard care instructions on the label, these don’t always apply. It all depends on what type of ‘finish’ you have on your pair. It’s important to note that you shouldn’t overwash (i.e. wash your jeans each time you wear them) denim. This causes the colour to fade much quicker and can sometimes lead to a ‘hairy’ appearance. Instead, if you see your jeans stretch out after wearing them, stick them in the dryer to bring them back to size!